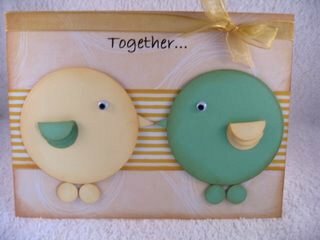 To make this Bird Card all you need are some circle shapes that you can cut with your punches. 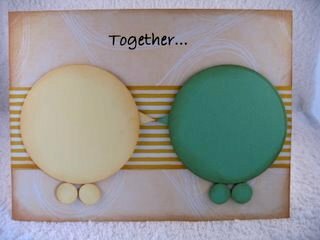 These little cards are another Circle Punched project, and they produce some of the easiest, fun cards you can make. You will need circles in three different sizes, and papers of your choice in two different colors. four small circles, which will make the wings. four dot sized circles, for the feet. 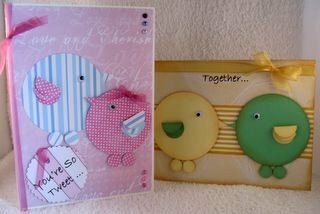 Plus two pieces of scrap card, for the beaks. Add your backing paper to the base card. I have added a stripey panel to mine. Using foam pads, build up each bird in one color. 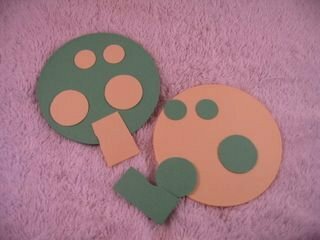 Place the two large circles for the body, add the two dot circles to the bottom for feet. Glue the beaks behind each of the bodies, so that they are just touching. Now to add the wings. Use the opposite color on each bird this time. Take your small circles and cut them in half. You will need three of these to form the wings. Glue the first one at an angle flat to the card. Put the second one on a thin foam pad, to raise it up and stick it at an angle over the first flat shape. Put the third one on a deeper foam pad and place at an angle over the other two. You can see in the picture how the yellow wing is layered. 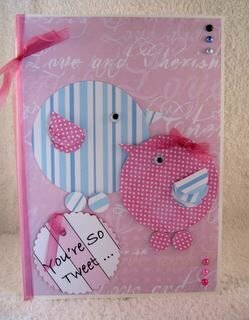 I have added the fabulous "Googly Eyes" to my Bird Card. Flat backed pearls and ribbons finish them off. Both have PC generated sentiments added to them. An easy card to make, so I hope you will give it a try.